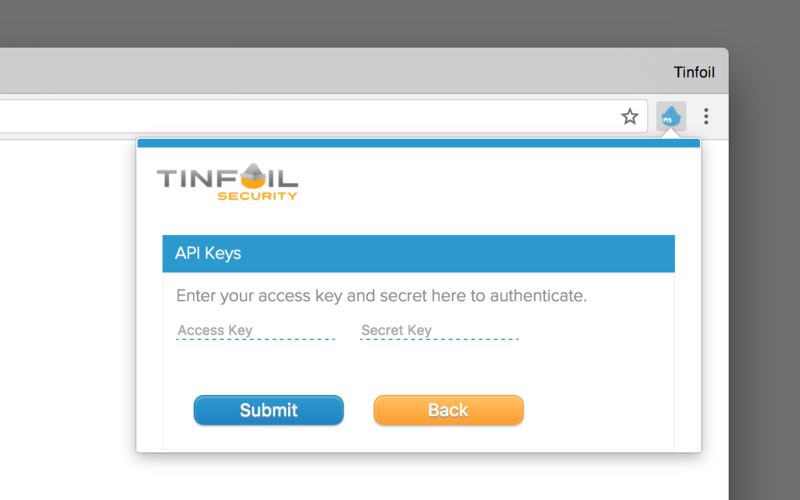 Ensuring our scanner can successfully authenticate into any given site has always been a priority at Tinfoil Security, and has helped us stay ahead. After all, if authentication fails, the scanner may not be able to access huge parts of a site, and can miss many vulnerabilities. Today, we’re announcing the Tinfoil Security Login Recorder: the easiest way for our scanner to authenticate into your site. The Login Recorder is a browser extension that allows you to teach our scanner how to authenticate into your site by recording your login sequence in your own browser. Simply install our Chrome extension and follow the on-screen instructions to submit your recording. Begin by providing API keys found here. 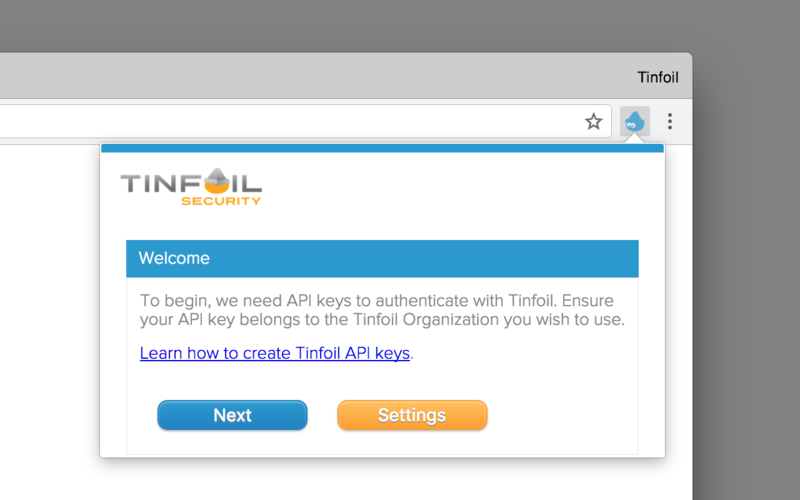 If you’ve never created Tinfoil API keys before, the first step in the extension has a link to an interactive tutorial that will show you how to make one. Ensure your keys are “Full Access”, otherwise the extension won’t be able to send data to our server. After you’ve authenticated, you’ll be asked to select which site you want to provide a recording for. Choose the site from the menu then hit ‘Next’. You’ll be warned about which sites have existing recordings, and submitting a recording for a site that already has one will overwrite the existing recording. When a site has been selected, you’re ready to record! Make sure you’re on the login page for the correct site, then hit the ‘Record’ button. At this point, the extension icon will turn red to indicate we are recording. Authenticate with your site as you normally would, then open the extension popup and click ‘Finished’ to end your recording. Next, you’ll be asked to select some ‘verifiers’ on the page after you’ve logged in by clicking on them in your browser. A verifier is an element on the current page that is not present before authentication. For example, if you authenticate with your site and are greeted with a “Hello, Nathaniel!” banner, this would make a perfect verifier. We use these verifiers to help figure out if our scanner successfully logged in to your site, or if something went wrong in the process. We recommend selecting at least 3 verifiers. When this is done, all that’s left to do is submit! Once you hit the ‘Submit’ button, your recording will be securely sent to our servers, and your next Tinfoil scan will mimic your recorded login to authenticate into your site. This new method of authentication will work on many different types of login flows. Whether your site uses a traditional style login page, or a complex multi-page authentication flow built to your site’s needs, the Login Recorder provides a simple way to get your account setup quickly and easily. Note that Tinfoil Security is dedicated to handling your sensitive information privately and securely. After submitting, your recording and API keys are removed from your system. On Tinfoil’s servers, your recording is encrypted using the same security practices as the rest of Tinfoil Security’s sensitive information. 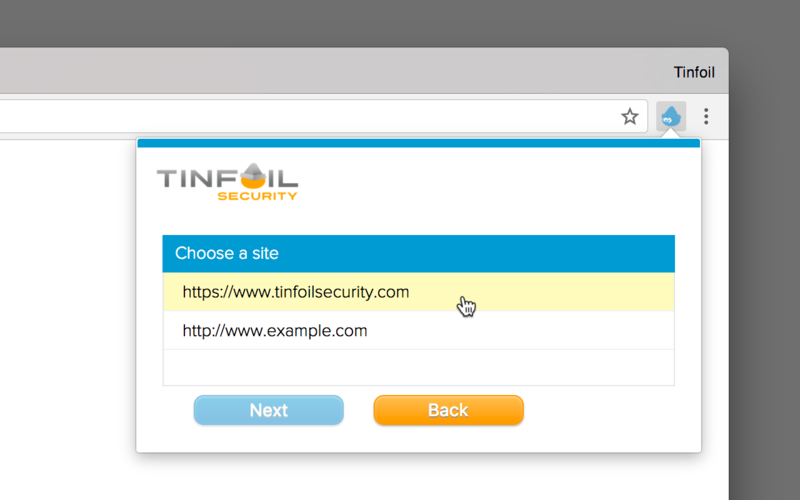 See https://www.tinfoilsecurity.com/security for more information. Visit the Chrome Web Store to try the extension today! Nathaniel is a Software Engineering Intern at Tinfoil. He's currently studying at the University of Waterloo and working on finishing his degree in Computer Science. He got into programming writing bots for online games back in elementary school. When he isn't coding, he's usually outside climbing something.